Released in 1971, AJ sold brilliantly but not for a long time, according to Mego, the first year resulted in 2.5 million Action Jackson figures being sold but the reorders didn’t pile up as hoped. While the Action Jackson was largely considered a failure, it’s signifigance is that led to the concept of using the basic body on any variety of characters. 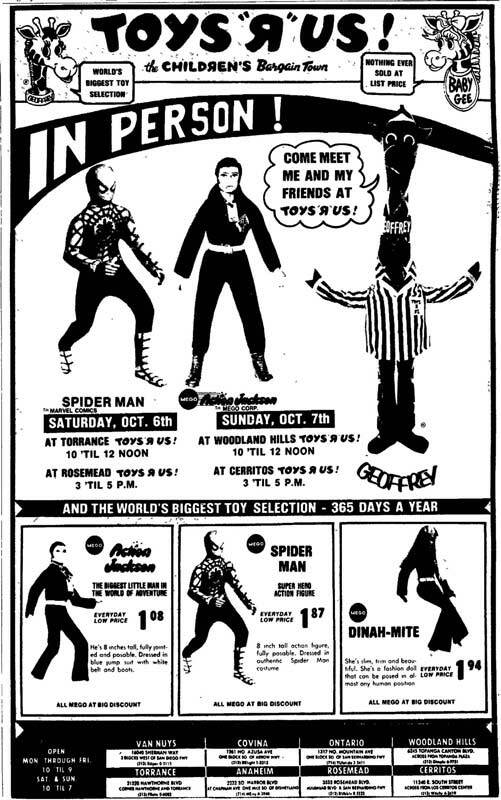 Most importantly, Mego’s next 8″ line the World’s Greatest Superheroes, arguably the companie’s greatest success and the item that sent the company into rapid growth mode. 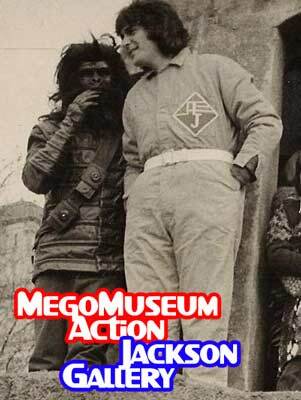 Action Jackson was all but forgotten by 1974 but he remains a big part of Mego collecting today. The many costume sets and bodies left over from the line are still relatively easy to find. Undeniably hokey, often poorly designed, Action Jackon is nonetheless a charming line to collect. This gallery provides a close look at all of his outfits, as well as a look at his playsets, vehicles, and other toys. 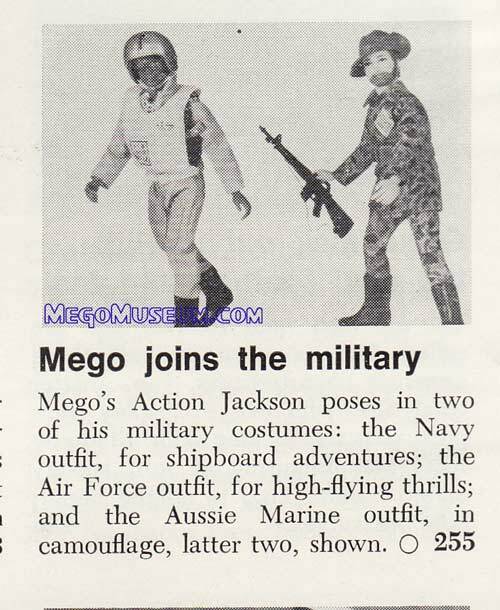 For more on AJ’s fascinating story and it’s place in Mego history please consult the 1973 Mego Catalog. As the ad below states, Mego purchased an unheard amount of TV spots for Action Jackson, a risky move for a company well rooted in news print ads. 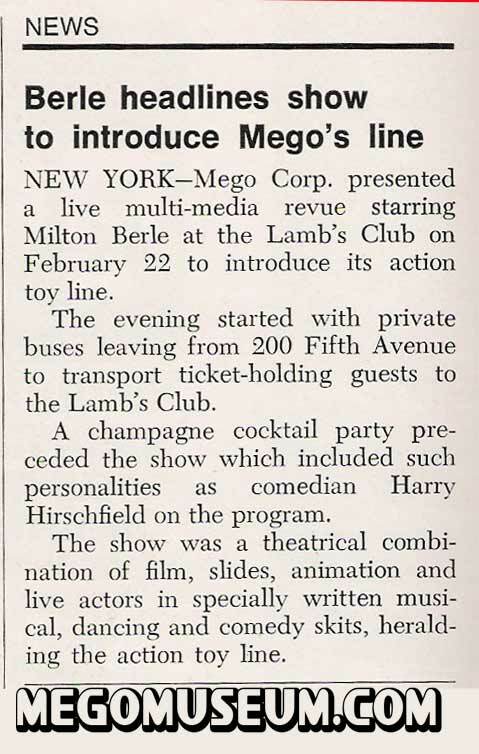 For more Toy Industry articles and information about Mego, check out the Mego Museum Ad Archive. 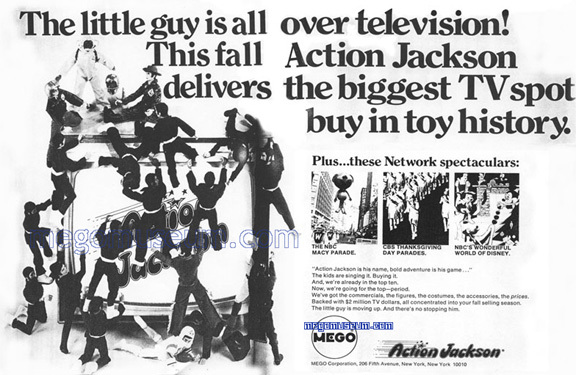 Just some of the ambitious advertising Mego attempted when they launched Action Jackson, a defining moment for the company shedding it’s image as a “lower priced toy manufacturer” and stepping up the plate as the biggest success story of the seventies.